I had a Virtual Connect Flex-10 interconnect fail in a c7000 enclosure and I have never had that happen before. I had asked my coworkers who said that they have done it before, but recommended that I should evacuate all of the ESXi hosts just in case there were any issues. 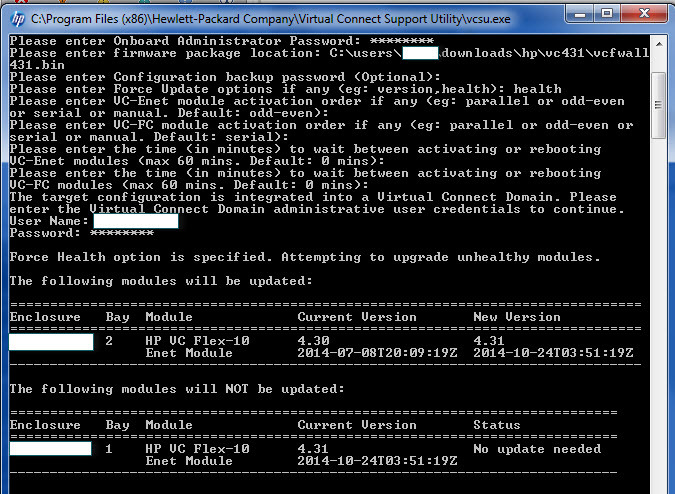 Once the HP CE replaced the Virtual Connect module, I immediately saw an issue: the replacement Virtual Connect was at a lower level than the remaining active Virtual Connect (my version was 4.31, the replacement was at 4.30). In the Virtual Connect Manager, on the replaced VC it says “Incompatible” and that was because the version was different from the active VC. I then proceeded to fire up the Virtual Connect Support Utility (VCSU) and attempt to figure out how to patch a single VC. At first I tried to use all of the defaults assuming that it would skip VC 1 and patch only VC 2. What I found was that since the replacement VC (VC 2) was in the current state, the state of the VC Domain was ‘not healthy’. I found a HP PDF that talks about a few options, mostly two that seemed to me would work. Since I was not in the Datacenter, I chose to use option 2. I re-ran VCSU but chose the ‘health’ override option with success! From the picture you can see that it will skip past the active VC (bay 1). 30 minutes later and VC 2 was patched and back up. Nice one! we are in the same situation, you said to put the new VC in spare Bay but from the screenshot it shows Bay2, showed it not be in bay 3? The Hp info gave two options, I selected option “2” which was to leave the replacement VC in the slot and run vcsu with the health option. Don’t read it as step 1 (put vc in spare slot), step 2 (use health option). They are two distinct options.